Here is what I got on the bench, working on right now! also I going to surprise him with a 1980 ford bronco, he had one at one time and would like another one. Kristi's Volkswagen beetle, painted yellow, got most of it. Just need to piece it together. 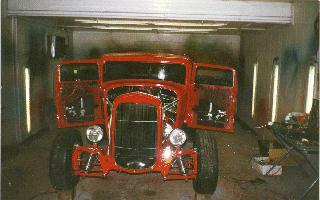 33 Willy 4dr sedan street rod. I bought it off for ebay already built. It has a resin body. The paint has some runs and the chassis needs a lot of work, and sorry but the 4-banger that the builder put in had to go. Will be replaced at this time by a chevy big block. 1999 kyle petty charity ride grand prix, this is a beautiful race car. The decals for it is very rare (they only made a 100 i believe). I might enter this in the contest that scale auto magazine is having. 1958 pontiac bonneville custom. This was a promo, and somebody cut off the top and pancaked the hood, So i got a 58 impala, cut and chop the top on it and put it on the poncho. I'm in the process of making the hood back to normal. this thing is much too pretty to pancake the hood. 1955 chevy belair coupe custom, I'm leaving the body stock, that is it. The chassis is from a 97 vette, custom interior (probably gonna flock the heck out of it. )It looks like the engine of choice will be 502 tpi rat. and fat wheels and tires with kandy teal finish from house of kolor. 1997 ron hornaday napa race truck, yes i still haven't finished it yet but it sure is close. 1969 camaro z-28 stock 1/12 scale, i need to get this one done and out of the way. it is paint and bare foiling it now, it is taking a lot of room on the bench. This will be on ebay for sale. 1950 ford with carson top. It is a resin model, it has a chevelle chassis and 454 motor. Will be purple w/ flames. this will be for sale on ebay too! And that is all i have room for!